In the midst of social justice movements such as #MeToo, pervasive sexist and racist attitudes are being examined across all sectors, including academia. The earth, oceanic and atmospheric sciences, collectively known as the geosciences, are the least diverse of all within STEM fields (science, technology, engineering and math). To examine this issue further, we studied how women and people of colour participated in, and were perceived at, an academic geoscience conference. Would we find evidence of discrimination and a "chilly climate" at the conference? If so, what could be driving this lack of diversity? We carried out this research at the 2017 meeting of the Canadian Geophysical Union and Canadian Society for Agriculture and Forest Meteorology, held at the University of British Columbia in May. Registration data could tell us the demographics of conference attendees overall, but not about the demographics of audience members and presenters within each session. To get this data, as well as to document the behaviour of presenters and audience members, we also made systematic observations during oral presentations throughout the conference. Compared to current membership in major geoscience organizations, attendance by women was slightly higher at this conference (36 per cent). 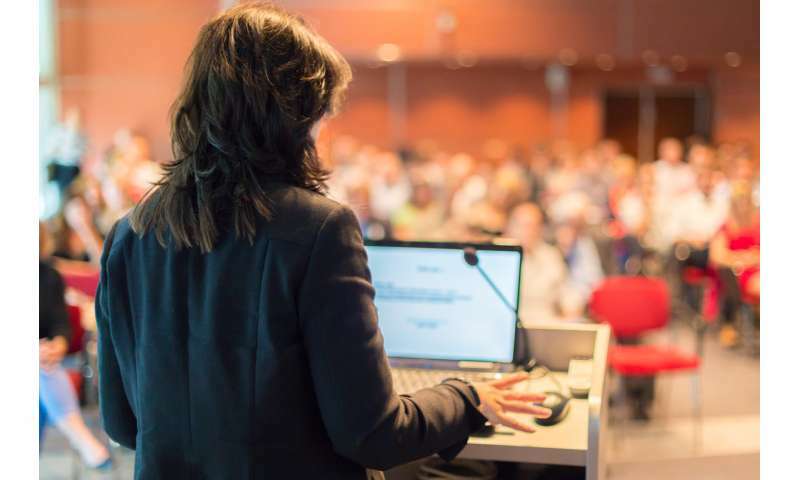 However, women were underrepresented as oral presenters (28 per cent) and especially as invited speakers (19 per cent). Women participated more in poster sessions, which are considered less prestigious at such conferences. Women and people of colour were also noticeably absent in some sessions. Only five per cent of all observed presentations were given by women of colour, who were especially isolated at this conference. Contrary to what we expected, some of the chilliest climates were observed where women were absent. In sessions dominated by male presenters, both the presenters and question-askers tended to display behaviours that indicate a sense of group-belonging and social dominance. For example, male presenters appeared more entitled with regards to time, and we recorded several incidences of male presenters arguing with or ignoring the time-keepers or session chairs. As presenters, they were more likely to use jokes (22 per cent versus 10 per cent of women), and sometimes did so at the expense of others through the use of gendered and sexualized language. Similar to other recent studies, women were less likely to ask questions than men, particularly in sessions where there were no female presenters. It's no wonder, especially since in all-male sessions, questions tended to be more aggressive with more arguments and interruptions. Meanwhile, in sessions where half or more presenters were women, the questions were more constructive and often complimentary. When audiences are distracted, it signals that they do not value your work. Our observations showed that while women presenters experienced more disturbances than men, people of colour experienced the most significant disturbances during their presentations. Our research supports the argument that there are cultural norms in science that cater to people in power and create entry barriers for those who, for example, might be put off by aggressive questioning styles, aren't part of inside jokes, or don't fit the stereotypical image of a scientist. If we want to make geosciences more inclusive, we have to consider these behaviours and norms. Many professional societies are instituting codes of conduct, which provide attendees with a way to report discrimination and hold perpetrators responsible, and may promote shifts in culture and participation. We saw, for example, that having more women organizing sessions can help bring women into conference spaces, while a recent study found that women will ask more questions when another woman is called on first. White academics should also make efforts to listen to people of colour, especially women of colour, when they tell us about their experiences in STEM fields. In this time of social change, the burden of proof can no longer be on marginalized voices. Rather, it now rests with the wider academic community, which must be frank about toxic cultural norms that have been allowed to breed within research and educational institutions. Let us act now to create a disciplinary research force better suited to represent, and work in service of, all humanity. Eminent examples of what "scientists" could call "anti scientific" machinations are present throughout the issue of "diversity". No one has demonstrated that "diversity" does any good, but "scientists" constantly try to claim it does. Most presentations don't provide proof that external forces necessarily oppose "diversity", they simply declare that it exists, then it is "concluded" that forces must exist that cause it. This article takes a different tack, ascribing "causes" of lack of "diversity" without actually validating the claims. If men start with a joke, why can't women? Why can't women ask more questions? What is the "disruption" that is referred to? And, note the glaring fault that nowhere is it examined whether or not lack of attention to women's and blacks' articles and lack of questions by women and blacks to others' articles might not be due to the fact that they have poor presentations and not very much understanding.